Find your way with the first quad helix GPS receiver that tracks both GPS and GLONASS satellites simultaneously. When using them together, the receiver has the ability to lock onto more satellites than using GPS alone, ensuring you can “lock on” to a position more quickly. Outdoor OptimisedGPSMAP 64 features a brilliant 2,6’’ sunlight-readable colour screen and easy operation with any kind of gloves in a shaky, cold or wet environment because it relies on a button based user interface. Dual Battery SystemGo further with GPSMAP 64's long-lasting 16 hour battery life. Works with 2 AA batteries or the the optional NiMH battery pack, which as an added bonus, can be charged while inside the device. 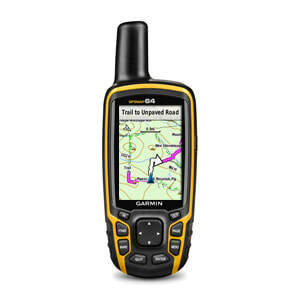 More Space and FlexibilityGPSMAP 64 gives you more flexibility with a 3.5 GB internal memory which gives you plenty of space for waypoints, routes, tracks and caches and a microSD card slot for additional mapping. Extensive Map SupportWith its microSD™ card slot and large internal memory, GPSMAP 64 lets you load a variety of maps, including GB Discoverer , BlueChart® g2, City Navigator NT® and BirdsEye™ Satellite Imagery (subscription required). Preloaded GeocachesStart geocaching immediately by choosing from the 250,000 preloaded geocaches from Geocaching.com. Caches come complete with hints and descriptions to get you started in the right direction. Interface: USB and NMEA 0183 compatible. Track log: 10,000 points, 200 saved tracks.